Three adjustable 3/4″ pine shelves are held with 1/4″ plastic locking shelf supports. The top of the drawer bank and the bottom of the case effectively make a total of five shelves. Let’s take a look, starting at the top shelf. The photos show the mere 3 inches of space above the top shelf on which are stored mostly chisels, along with some knives. To the right is a gaggle of screwdrivers. Each chisel and knife is protected in a pocket of a leather tool roll that has been cut lengthwise along its midline and positioned at the rear of the shelf. I know my tools well enough to recognize each one by its handle end. 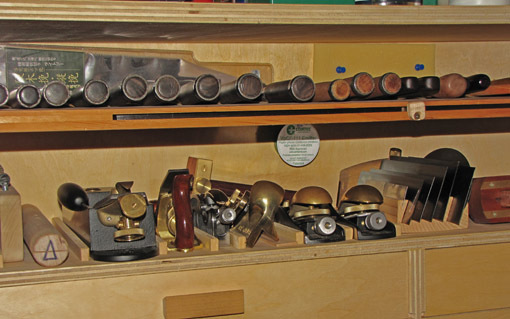 The next level down – the top of the drawer bank – holds small planes, scrapers, and spokeshaves. Each plane’s parking space is delineated by a thin strip of wood held in place with just two small brads. Of course, as you would guess, these are easy to reposition. Card scrapers are held in a piece of 2×4 into which kerfs have been sawn along the grain. Also notice the Cortec rust inhibitor cup, one of two in the cabinet, stuck onto the back panel under the top shelf. The next shelf, my favorite, holds most of my major planes in the same type of parking spots described above. Unfortunately, the jointer and the two jacks have to be stored along the length of the shelf and therefore are exceptions to the desirable arrangement of unblocked access to each tool. It’s not much of an issue though, because I don’t use the jointer, parked in the back, nearly as frequently as the jacks, whose parking spaces are interchangeable. The lower two shelves hold, in no special system, all sorts of items including drill bits, tapes, mallets, and tool documentation. Here it is practically impossible to have direct access to everything, but I do prioritize access based on how frequently I use the items. The 30-drawer, plastic small-parts chest holds small screws and lots of little tools and parts that would otherwise tend to get misplaced. Next, a look at the drawers, simple and practical. 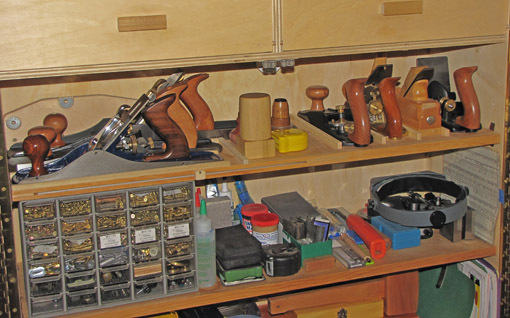 The one thing I like most about seeing other woodworker’s tool storage, is the ideas I take away from it. I especially like the ruler storage in the saw slot. The edge is dead space and now it isn’t. Can’t wait to see the ideas I can get from the drawers. Thanks very much for the cabinet description. I’ve been contemplating a similar cabinet for a while and your insights are really helpful. Mine will hang on the wall to the right of my bench. Did you give thought to storing your longer planes upright and next to each other? Having longer planes behind others would be a bother. I’d love to hear what you’d change if you started over. I know you said you’d make it deeper, but is that it? The drawers are pretty simple, but then, that’s a good idea in itself. A smaller version might do well on as a wall-hung unit, but I think a cabinet this big should be free-standing. Really it’s only the jointer that is less accessible. For my purposes, it wouldn’t be worth a redesign. This cabinet has become like an old pair of jeans, so comfortable as to dismiss thoughts of something better. I guess if I was starting over, yea, a couple of inches more depth would be nice. And when that was built, I’d probably say, gee, a little bigger would be better still. I’d probably waste time with fancier joints and nicer plywood. But really, a cabinet this size puts some limitations on my tool appetite, which is a good thing, just like those old jeans do! You guys are experienced woodworkers, so all I’m doing here is showing one guy’s approach to which can be added your personal touches.